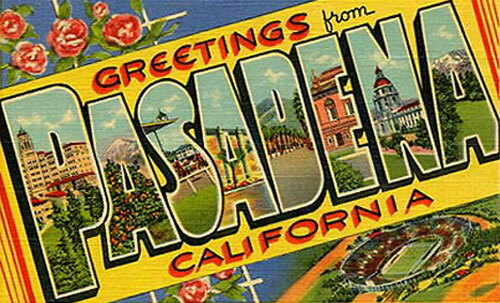 Growing up in San Diego, I would occasionally visit Los Angeles, and though it has never been my favorite city, I have always adored visiting Pasadena, CA. Less than 10 miles north of downtown, it seems a world away from the hustle and bustle of L.A. The feel of Pasadena is “upscale vintage” to me, with the abundance of Craftsman-style homes and wide palm tree lined streets. 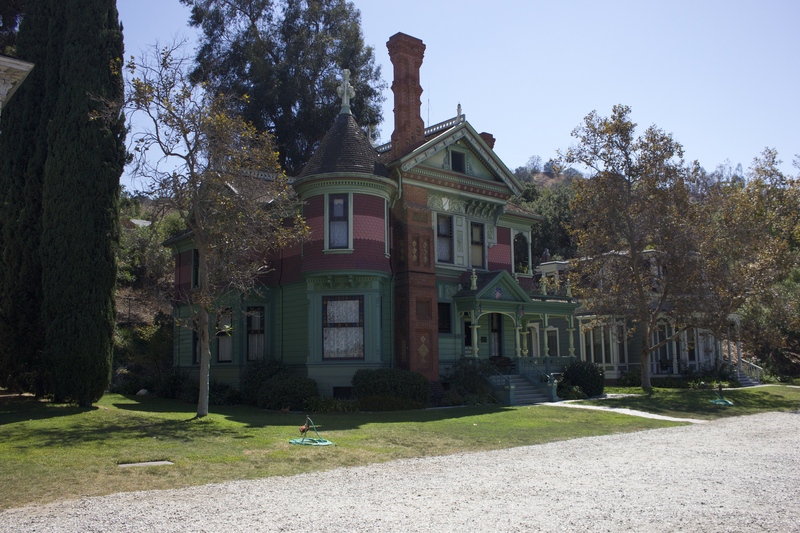 Yet, one of the things that has always intrigued me on our dives was, traveling North on the 110 Freeway from L.A to Pasadena, we would pass this enclave of amazingly beautiful Victorian Houses situated at the end of a seemingly normal street. The houses were all lined up in a gated, quite, garden-like setting, almost as if it were a house graveyard. 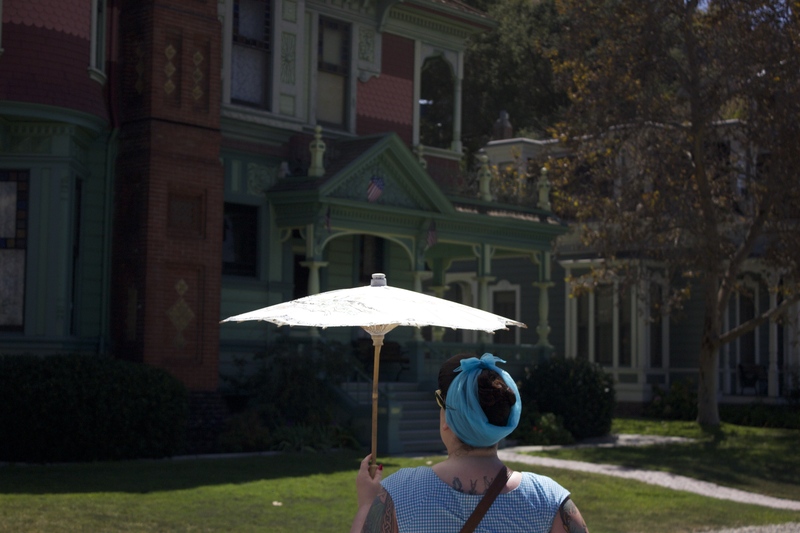 So on our last trip to California in September 2014, I was finally able to visit this Victorian house wonderland. It’s called Heritage Square and it is AMAZING. The day that we visited. it was over 100° and there was only one other visitor there, so we were able to have a nice personal tour of all the homes. Here is an excerpt from their website to explain what this living history museum is all about. 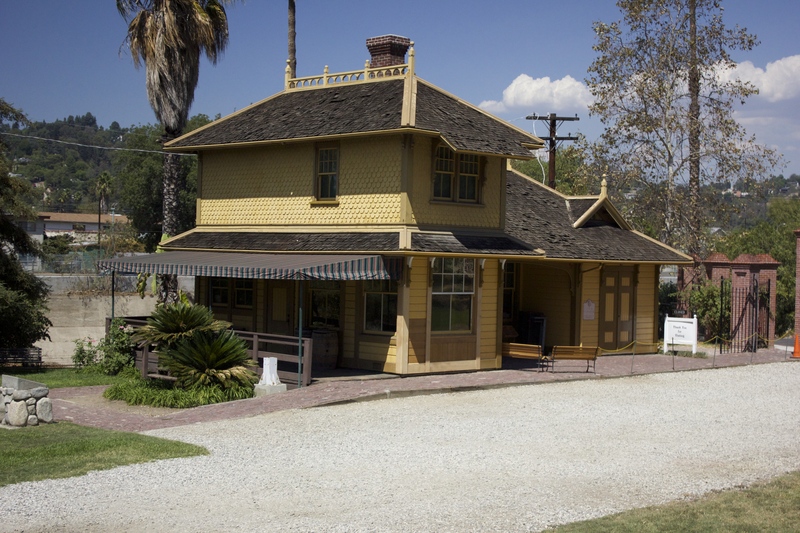 “Heritage Square Museum is a living history museum that explores the settlement and development of Southern California during its first 100 years of statehood. Unfortunately we were not allowed to photograph anything from the interior of the homes, but we did get wonderful photos of the exteriors. 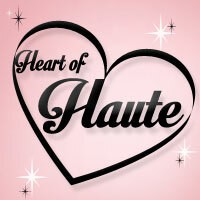 Each description comes directly from the Heritage Square website. 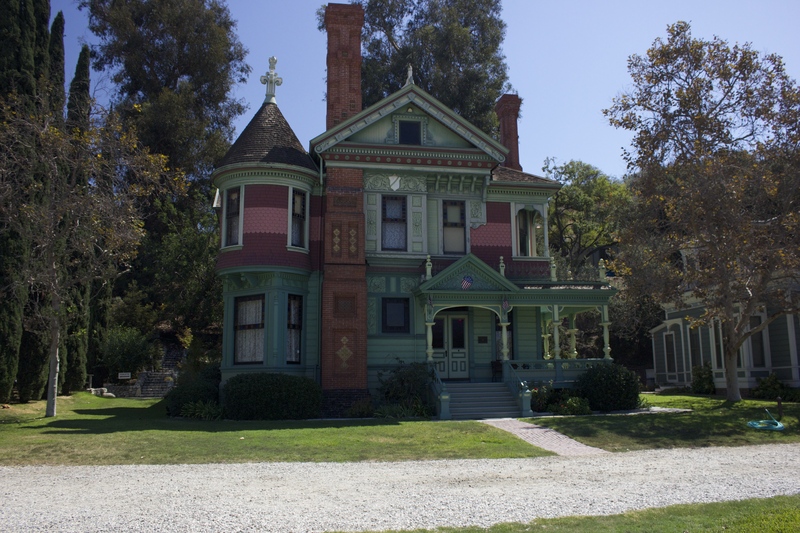 The Hale House was built in 1887 by George W. Morgan, a land speculator and real estate developer, at the foot of Mount Washington just a few blocks from the museum in Highland Park. 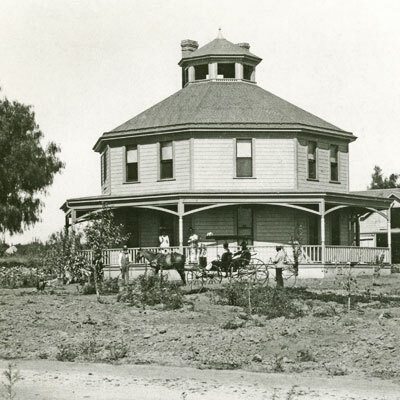 From the time of its construction, the house was sold many times and was moved from 4501 to 4425 North Pasadena Avenue (now Figueroa Street) before being purchased by James G. Hale in 1906. 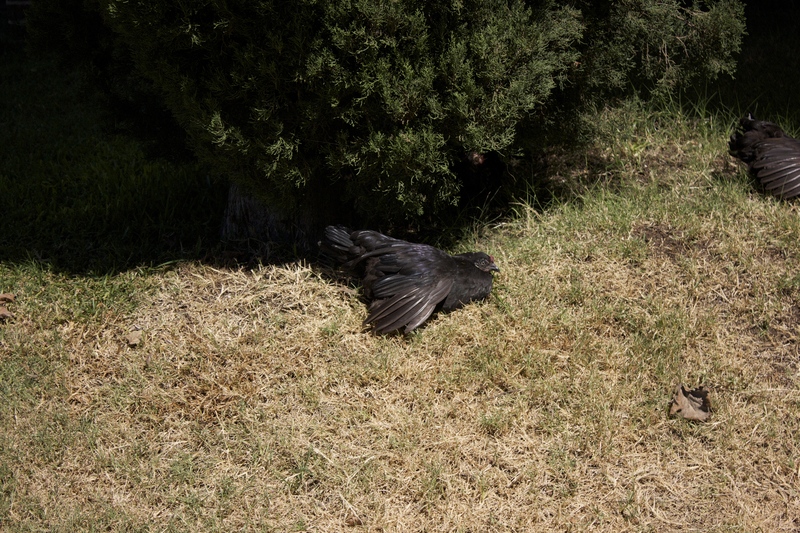 There were chickens walking around and sunning themselves around the grounds of the museum. Architecturally, the Valley Knudsen Garden Residence is a very interesting building. 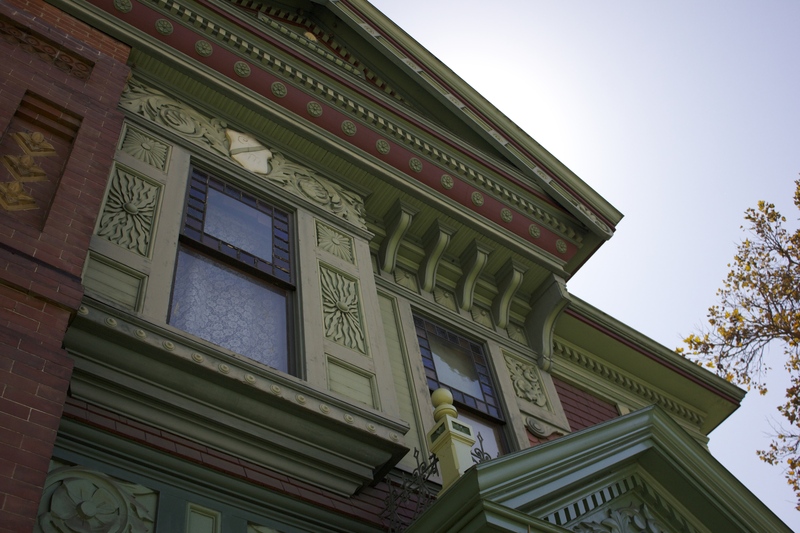 Most middle class homes of the Victorian period were done in varying combinations of the Eastlake or Queen Anne styles. The choice of this Second Empire with a French Mansard styled roof for this working-middle class home was rather unusual for the West coast. 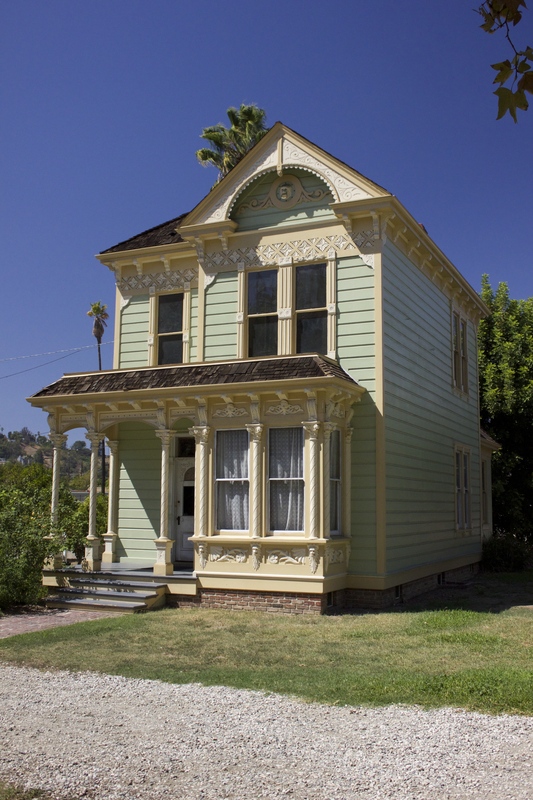 The home originally stood on Mozart Street in the neighborhood of Lincoln Heights, one of the first suburbs of the City of Los Angeles. Originally a Southern Pacific railroad town, Lincoln Heights is know for having one of the city’s largest parks, Lincoln (Eastlake) Park. At the turn of the century, Lincoln Heights was a destination for families to visit, having both an ostrich and an alligator farm, the Selig Film Studios and later on, the Selig Zoo. The Selig Film Studios was one of the first motion picture studios to be established in Los Angeles, and was originally located just north of Lincoln Park on Mission Avenue. 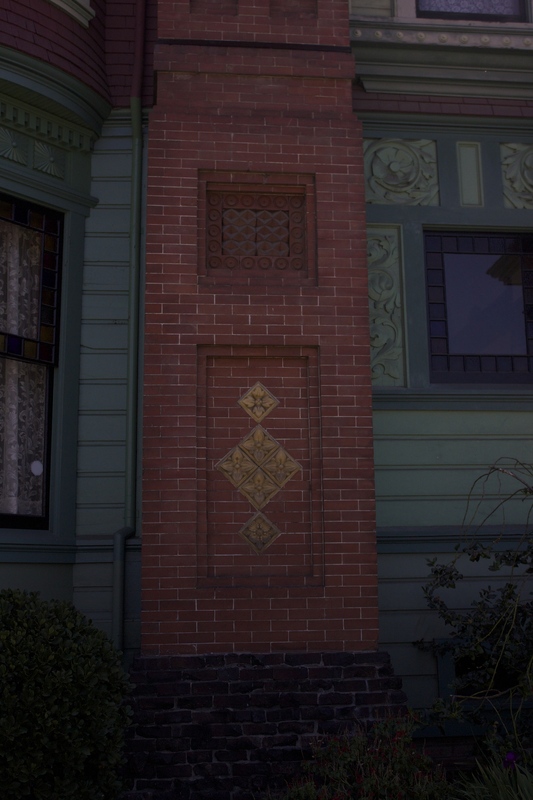 The Ford House was built in 1887 as part of a large tract of simple middle-class homes in downtown Los Angeles built by the Beaudry Brothers. It would be unremarkable today if not for its original owner, John J. Ford, a very prolific and well-known wood carver. 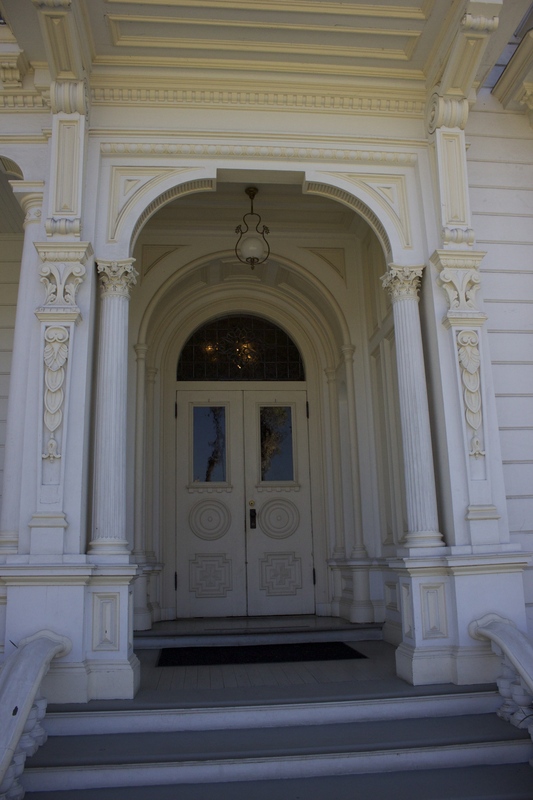 Ford’s works include carvings for the California State Capital, the Iolani Palace in Hawaii, and Leland Stanford’s private railroad car. John Ford purchased the home as it was being completed. At the height of the Industrial Revolution when all decorative elements for house exteriors were being mass produced, Ford used his skills as a woodcarver to adorn his home. 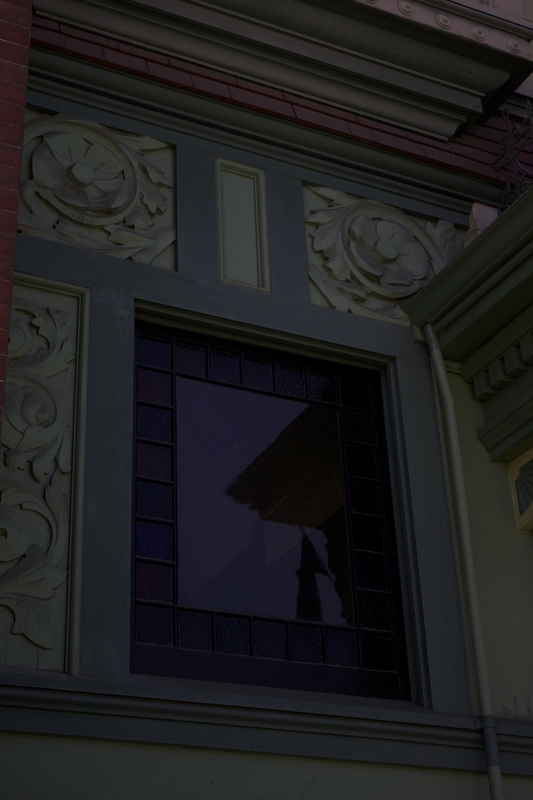 The exterior and interior carvings were all done by hand in ornate, one-of-a-kind patterns. 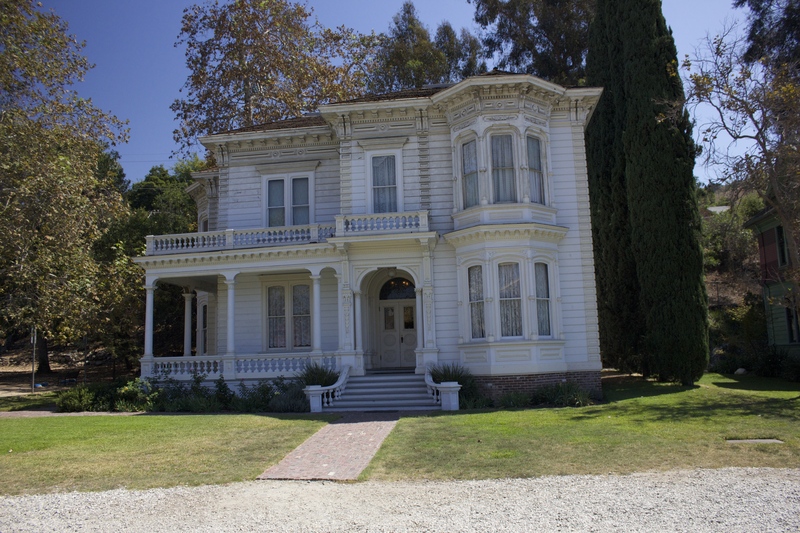 The house, a combination of Italianate and Queen Anne styles, was located on Beaudry Street, between First and Temple Streets in downtown Los Angeles. Overland travel by wagon, stagecoach or horse to the West, and Southern California in particular, was expensive and slow and trails were poorly maintained and badly mapped. With the arrival of the Southern Pacific in 1876, Southern California was transformed virtually overnight. The train offered a more efficient solution for hauling mail, freight and passengers. Farmers from the east and mid west were the first group courted by the railroad to settle the region. The railroad profited by transporting agricultural commodities across the country. Furthermore, Los Angeles was a paradise compared to cities in the east that seemed to be choking on factories and overcrowding. 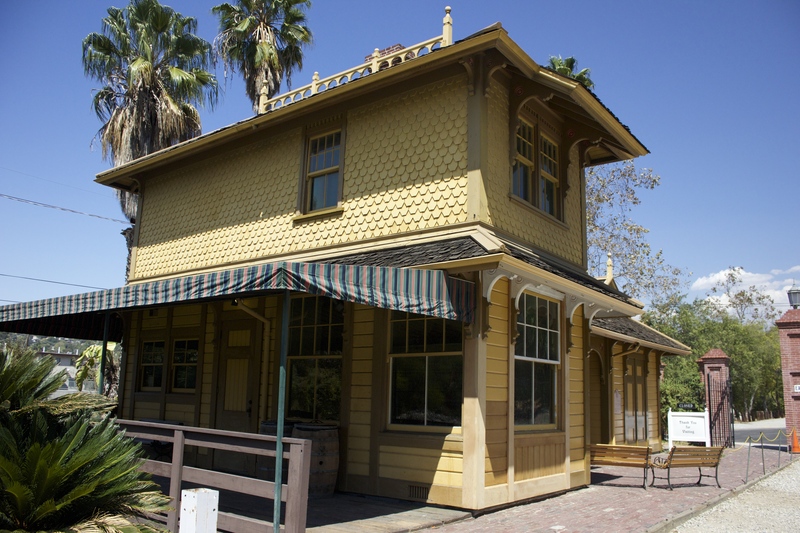 The railroad companies, the largest landowners in California and eager to sell more of it, was responsible in many ways for manufacturing an idealized version of the area’s assets and potential, what today we call the “California Dream”. 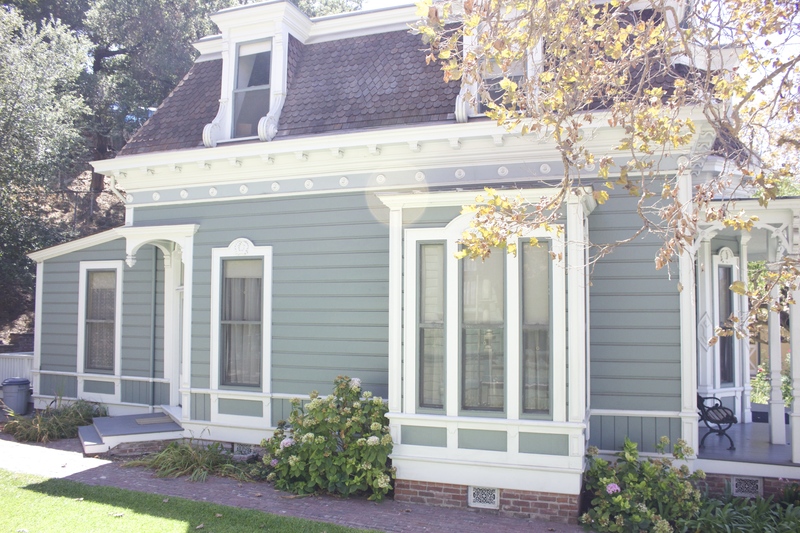 The exterior and interior have been restored to their original Eastlake style. Today the depot serves as the Museum’s Visitor Center and Store. Tours begin on the station platform. 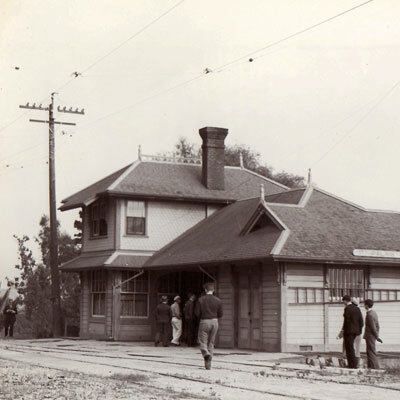 Photo of the original depot from the Heritage Square website. 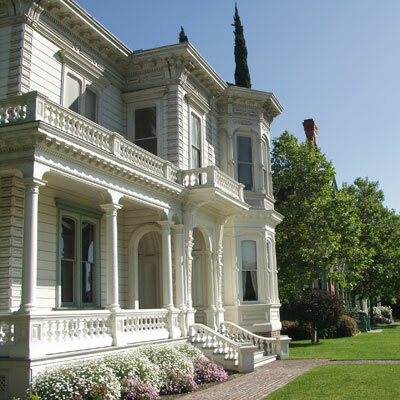 The largest house at the museum, The Perry Residence was built in 1876 by prominent businessman and lumber baron William Hayes Perry. The house was designed by renowned architect E. F. Kysor and is an example of classic Greek Revival Italianate as shown in the outward sweep of the entrance stairway, the brackets under the eaves, the slanted bay windows and the narrow columns. Opulent touches such as the house’s fine hardwood floors and marble fireplace mantles were meant to reflect the social prominence of its owners. When it was built in the then-fashionable neighborhood of Boyle Heights, it was arguably the finest and most expensive residence yet seen in Los Angeles. In 1848, Orson S. Fowler, a Yankee individualist and progressive social thinker, published a book entitled The Octagon House: A Home For All. In it, he argued the advantages of an eight-sided house over the standard four-sided variety. Windows on all sides offer more light and better air circulation which, in turn, lowers heating and cooling expenses. 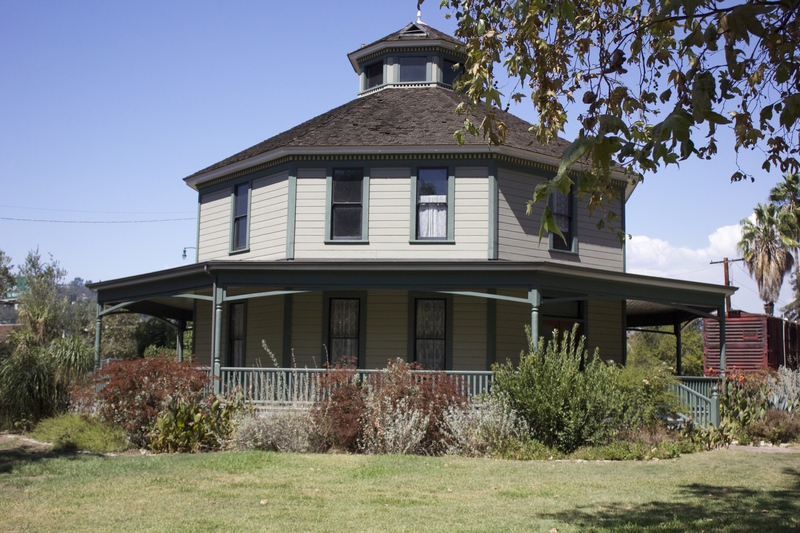 An octagon also cost less to construct, requiring shorter spans of lumber than conventional buildings. 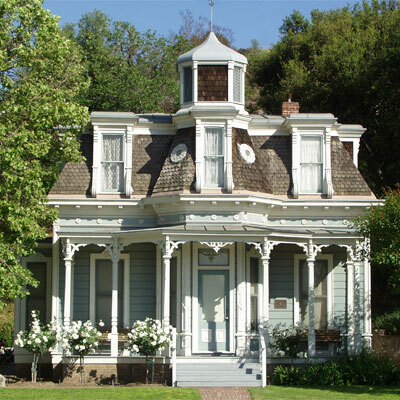 Fowler’s architectural ideas were popular in the East, where most octagonal structures and homes were built. However, the popularity of this architectural style almost completely died out by the time of the Civil War. For the original owner of the museum’s octagon, Gilbert Longfellow, this was not his first eight-sided home. Gilbert Longfellow built his first octagonal house along the coast of Maine. 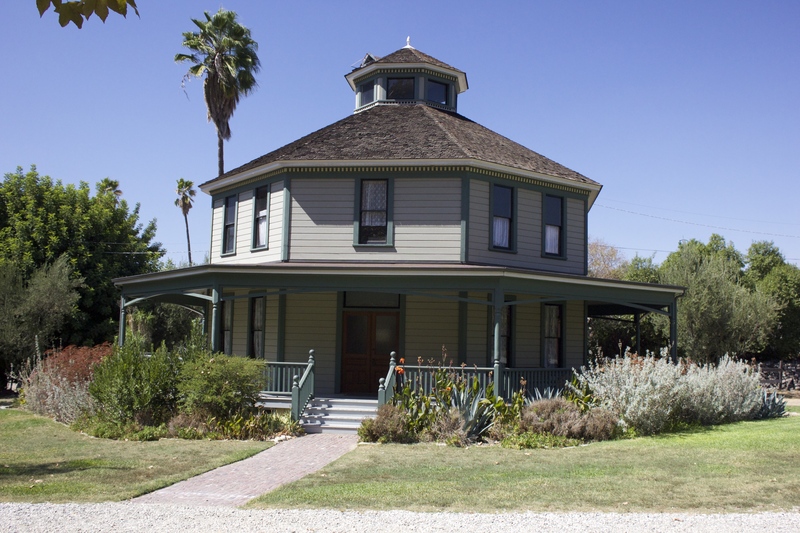 Then in 1893, after moving to Pasadena, Longfellow built his second octagonal home on San Pasqual Street. After Longfellow died in 1912, his son Charles continued the family’s farming business, purchasing additional land nearby (now part of the California Institute of Technology campus) where he established a small, but successful, citrus grove. In 1917, to make way for subdivision of the original farm, the house was moved to a city lot about a mile north of the farm on Allen Avenue. 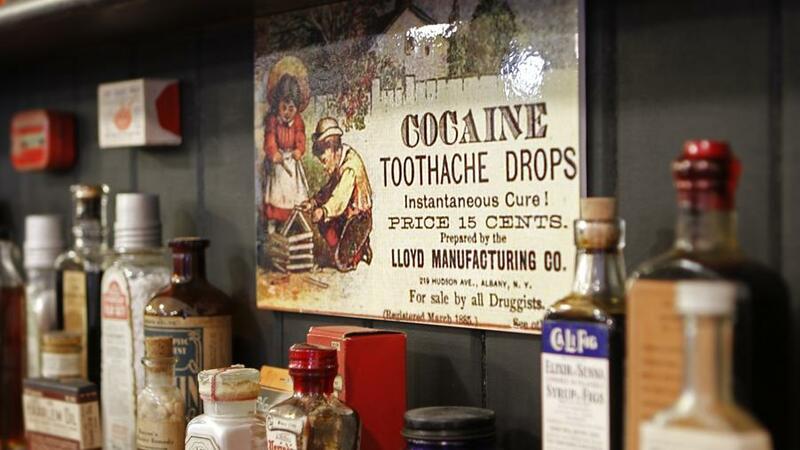 Corner drugstores have historically been a fixture of both urban and rural communities. Before the large chain drugstores of today they provided for the community’s health and served as an important community meeting place with their soda fountains. 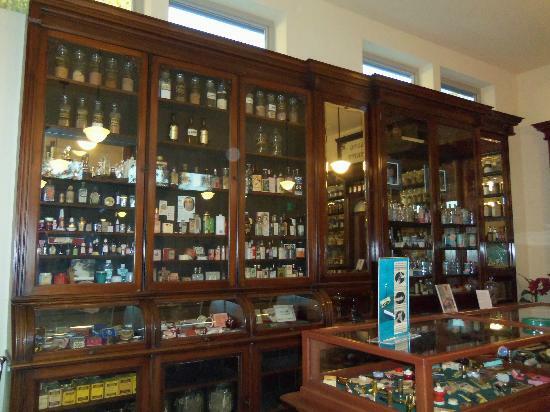 Colonial Drug is a recreation of the original business that George A. Simmons owned and operated in Highland Park after World War I. 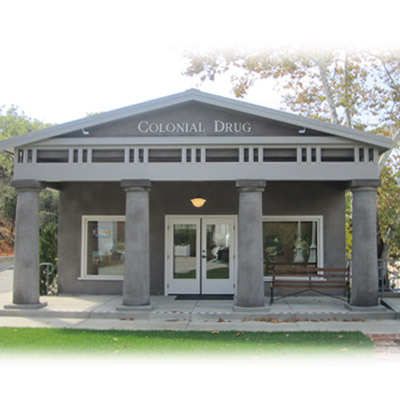 Formerly located just a mile away from Heritage Square at the corner of Avenue 57 and Figueroa (then Pasadena Ave.), Colonial Drug served the local community for six decades. 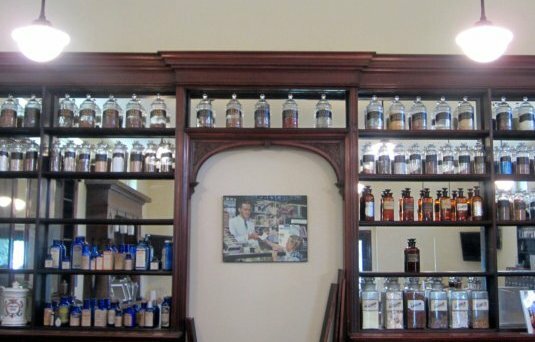 In memory of George A. Simmons, the Simmons family generously donated the original fixtures, vintage soda fountain, and his unique collection of drugstore products to help Heritage Square recreate Colonial Drug from the ground up. This last building was my absolute favorite (and not just because it is the only air conditioned building)! Our tour guide dropped us off in the cool air of Colonial Drug and introduced us to the incredibly enthusiastic volunteer who regaled us with the story of Colonial Drug. 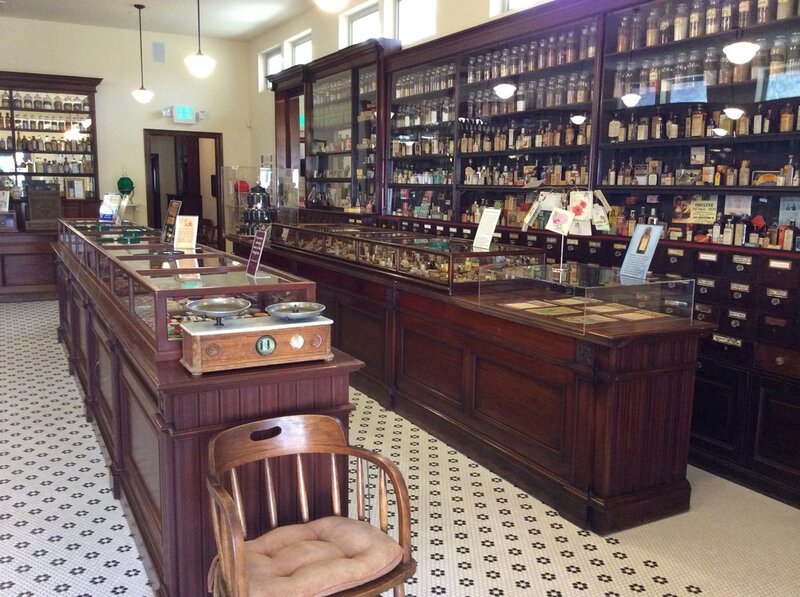 We were able to spend as much time as we wanted inside perusing all of the offerings of this amazing apothecary. If you are ever in the area, this is a museum I HIGHLY recommend. This looks like a fabulous museum – thank you for sharing it! I’m always amazed that they can move those large homes, but I’m so glad they saved them! I’m planning a trip to LA and will have a rental car to get around… do you know of any places there/very near there like Heritage Square that would be worth visiting?